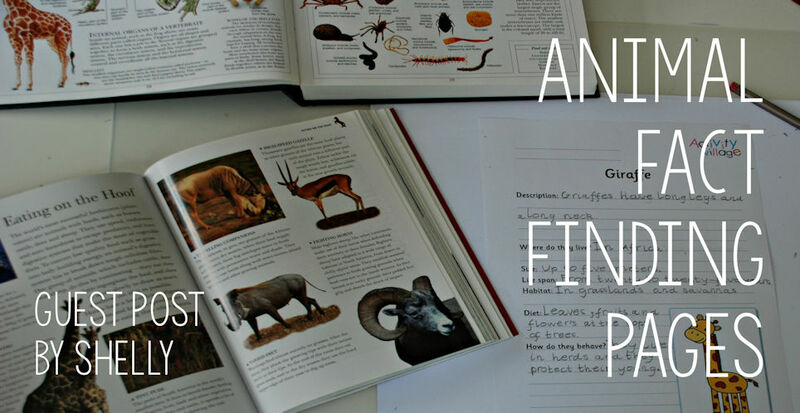 One of my kids' favourite and most used writing pages from the website has to be the Animal Fact Finding Worksheets. We have used them over and over again on numerous different projects. Even last year when my son was NOT keen to write at all he would still fill out summary pages for his favourite animals. We found them really useful to use after we had read up about animals. In fact these pages were the first real way that I introduced note-taking with my daughter. She would read a number of different books / sections of a book about a certain animals and then then she would summarise what she had read using the fact finding page. And she even started adding a few of her own headings on the reverse of her animal fact finding pages. We also found that the fact finding worksheets and the animal booklets work really well together. But lately the pages have been used on an entirely new project that my kids came up with. It started with my son creating lists of deadly made-up animals. He made numerous lists – the top deadly sea creatures, the top deadly endangered animals, the ALL- time top deadly creatures – we have list after list of his made up animals. But then he started thinking more about the individual animals and what made them unique and he wanted to write the characteristics down; he is thinking of possibly making his own made-up animal book. But he is still not the most confident writer and is not a fan of a blank page. He likes having some guidelines so we downloaded the Blank Animal Fact Finding Template. It was perfect! He was set and off he went writing about all his different creatures. And he enjoyed drawing what he thought they looked like. For a few of his made up creatures he actually used some of his toys for his drawings. He even managed get his sister to join in and help him create the fact sheets for the creatures. His sister loves writing but did not want to draw any of the animals so we came up with a compromise for her. We would search for a fact finding page of an animal similar to the made up one and then print it out in black and white. That way she could colour them in as required and change the headings for the animals. Even with the made-up creatures she still found it useful to use some of our animal books so she could read up about similar animals. So even with the made-up creatures she was still doing the researching element. We now have a massive collection of animal fact finding pages. For some animals we even have different versions of the pages (because, as my kids informed me, scientists normally change their initial findings about animals after they spend more time observing them). But I am not complaining, I am happily printing out more fact finding pages just so I can sit back and watch both kids happily write about their new animals.